Why have I never known about this deliciousness before? Why is it that I’m only just finding out about this Turkish not-so-secret secret? How is it that I live in a massively cultural area and this yumminess has only just surfaced in my world? My friends, I bring you… AMBROSIAC SALEP!!! Ambrosiac Salep is a Turkish drink made from salep flour (I’ll explain below), cinnamon, milk, sugar, and orchids. Orchids? Yep! Salep flour is made from orchids. It used to be very popular to grind orchid bulbs into powder and make beverages and desserts from the base. This originated in the Ottoman Empire, made more known by the Arabs and Ancient Romans, and gained popularity as it spread to England and Germany. 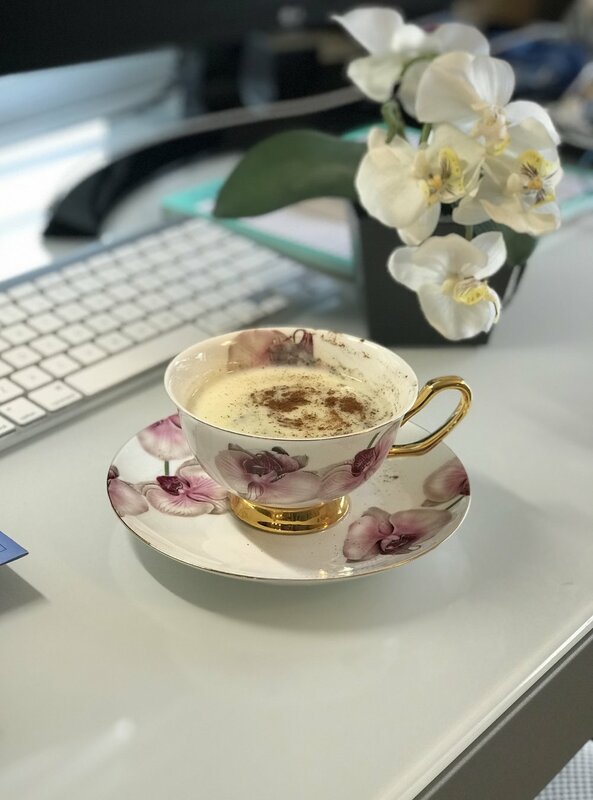 Salep is also known as sahlab, sahlep, and salepi. Although there’s skim milk powder in this salep mix, I opted to use milk to make my drink. Some use water. I found out that, if you use half-and-half, add more salep powder than usual, and stir over over high heat— it becomes custard-like! SCORE!!! I love custard, especially one that tastes like this! I digress. Custard will be another blog post for another day. 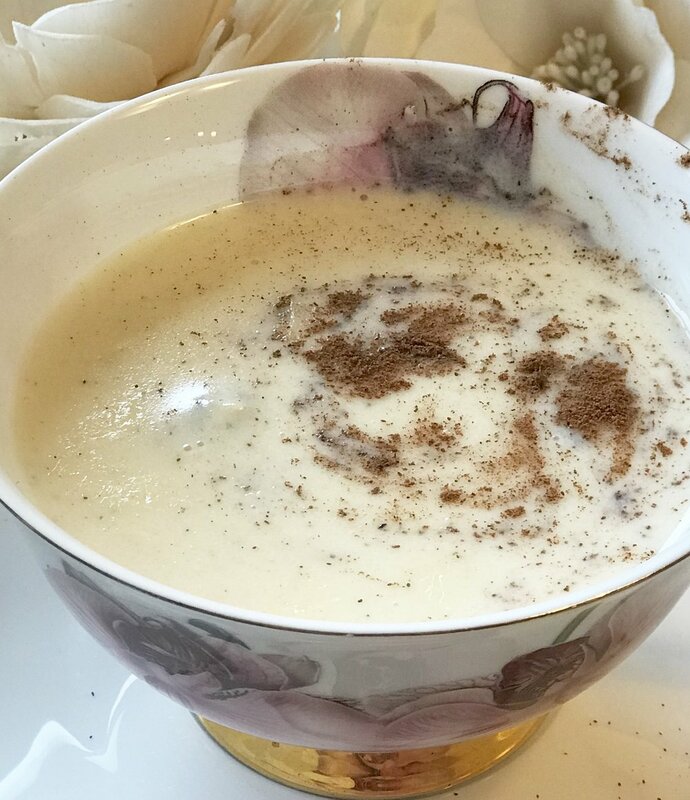 Ambrosiac Salep is creamy and reminds me of the holidays as it’s white, pillowy, and heart-warming. It could be enjoyed in the place of hot chocolate, coffee, or tea… or mixed in with any of the three. I can imagine adding extra cinnamon, rosewater, pistachios, and even stepped cardamom tea for a magical sort of chai. I bet, if more people knew about it, the creative cafe owners of the world would simply add sprinkles and marshmallows to make Unicorn Salep. (Disclaimer: If you make Unicorn Salep after reading this, and you sell it, you must send me a percentage of your profits. Cha-CHING!!! Haha!). 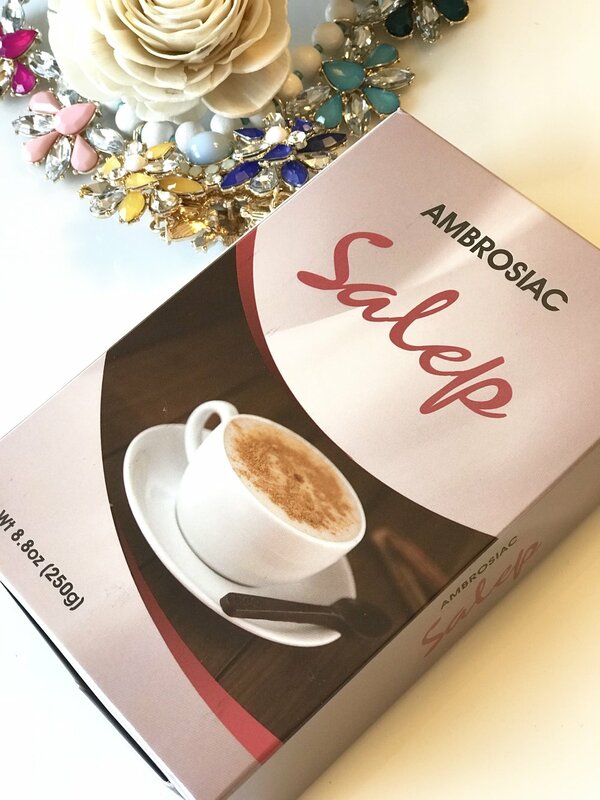 Preparing Ambrosiac Salep is super easy and took only a matter of minutes. One could prepare a microwaved salep, but I chose to prepare mine over the stovetop, and it still only took me a few minutes. Preparation directions are shown on the back of the box. 5) Pour into the cutest coffee or tea cups you own, because it’s so amazing, you have to put this in amazing cups! -Prepare with more Ambrosiac Salep and cream (instead of milk or water) to make a custard. Top with ground pistachios!